when Dom Goddard sprung the offside trap to chip the keeper and put the visitors ahead before Alex Tilley was tripped to win a penalty that Nathan Rippin smashed home to double the advantage. Nicky Frost then combined brilliantly with Dan Baines before racing clear to further extend the lead to three at half time. Pointon reduced the arrears in the second half before Goddard instantly restored the three-goal advantage. The hosts then rallied with two goals before Frost curled in a phenomenal free kick to make the final score 5-3. The Pointon goals came from Ian Jacquest, who struck twice, and Sam Husband. On a sour note, Leverton lost defender Joe Money early on to a nasty looking foot injury that may yet rule him out for a while. Leverton learnt later on that they will now play North Somercotes United, who beat Moulton Harrox 4-2 on penalties in the county cup. The scores stood at 3-3 at full time and 4-4 after extra time. Boston College produced a battling performance to grind out a 1-0 home win against Old Leake. If Old Leake had taken their chances during the first half it may have been a different story, the post coming to the College’s rescue and their goalkeeper producing two fine saves. The home side then rocked their opponents by grabbing what proved to be the winning goal on the half hour mark when Cameron Holland found the net. The second half saw Old Leake still on top in the possession stakes but the College proved stubborn opposition and as they dropped deeper, the visitors found it more and more difficult to find a breakthrough. Coningsby produced their best performance of the season when they thumped Wyberton Reserves 5-0 at home. Shaun Boothby and Jamie Congalton both scored twice before Jack O’Briene wrapped up victory with the best goal of the game when he fired home a screamer of a shot. Benington let a two-goal interval lead slip as Skegness Town Reserves maintained their push for Premier Division honours on the 3G pitch at Wainfleet Road. Tim Bell’s brace in the opening period had put Benington in control, but Daniel Reid struck twice after the restart to get Skegness back on level terms. Kurt Crossley then put the Lilywhites in front, only for Jonny Cheer to scramble home an equaliser with 10 minutes remaining. However, Crossley had the final say as he pounced late on to fire home a close range winner. Final score 4-3. Spilsby Town stay hot on the heels of the leaders following a 7-0 away win at Ruskington Rovers, with Jordan Smith claiming an amazing haul of five goals. Liam Papworth grabbed the other two goals for Spilsby. Horncastle Town Reserves hit Swineshead Reserves for six in their home clash. Ryan Beaumont grabbed two of the Town goals while Andy Bullivant, Jamie Riddel and Rob Morey completed the scoring in a 6-0 home win. Kirton Town took maximum points against Friskney at Graves Park following a 3-1 home win. Chris Hilton, Ashley Davies and new signing Conor Eyes were all on target for Town. Greg Brown replied for Friskney. Two goals from Cameron Robertson helped Woodhall Spa United to a comfortable 4-0 home win against Fosdyke. Paul Clarke and Callum Cheetham grabbed the other United goals. Swineshead A claimed a welcome three points in a 6-3 home win against Coningsby Reserves. AshleyWebb, Andy Chapman and Jamie Todd hit the Coningsby goals but they weren’t enough to earn any reward. In an even game at Park United, with both teams having several chances and hitting the woodwork, it was a fifth-minute penalty won and scored by Ian Mitchell to give Fishtoft the decisive goal which settled the match. Billinghay Reserves were far from happy after they scored three times in their home match against Kirton Town Reserves, but still finished up empty-handed. Shane Underwood-Harley, Frazer Howseman and Billy Redpath were all on target for Billinghay but it was all to no avail as Town returned home with a 4-3 away win. Boston College Reserves took the lead at Leverton Reserves before Jack Mitchell scored the equaliser with a superbly struck free-kick from a free kick 35 yards out. The College took the three points, however, with two further goals to run out 3-1 winners. Liam Pitts marked his return from a six-week lay-off through injury with a fine hat-trick for Old Doningtonians Reserves in their home match against Fosdyke Reserves. A Ryan Mills double helped the Dons to a comfortable 5-1 home win. Benington Reserves and Spalding Harriers shared the points in a 1-1 draw. The Harriers’ leading scorer, Rafal Marczewski, was again on target for his side while Benington’s reply came from an own goal. There was one cup shock and that took place at Sibsey, where The Division Two leaders hosted AFC Tetford from The first division. Lewis Emmanuel (two), Tom Pogson (two), Ryan Huskisson, Lee Waters and James Carr were all on target for Sibsey in an amazing 7-2 home win. 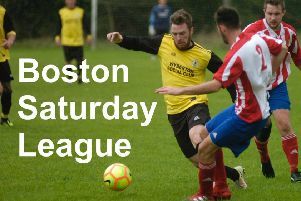 Fulbeck United, not unexpectedly, inflicted a heavy defeat upon Boston Titans. Callum Clay (three), Martin Wilson (two), Paul Crampton (two), Ben Pollard, Chris Bates, Dylan Grocock and Marcus Walmsley all got in on the act in an 11-1 score-line. Old Doningtonians also had an easy passage through to the next round with a 7-0 away win at FC Hammers. Mark Sharman (three), Brandon Harker, Andy Slaughter, Luke Barnett and Liam Barnett grabbed the goals for the Dons. Reece Lovelace also hit a hat-trick for Freiston in their 5-2 away win at Mareham United. Perrie Dale and Tom Bates completed the scoring for the visitors while Tony Webb replied for Mareham. The big clash of the day saw Fishtoft edge out Railway Athletic by the odd goal in three. Fishtoft started brightly and they soon opened the scoring when a sublime Ben Parkinson pass split the Railway defence and Tom Ruck fired home from outside the box. This was quickly followed by another sweeping move from Fishtoft which Neil Allen finished off from close range. The game then settled down to a midfield battle with Fishtoft carving out the clearer cut chances before Railway clawed themselves back into the game when clever play from Ryan Mason won a penalty which Jake Portas converted. The game then boiled over a little with a Railway player being dismissed for an off the ball altercation, which took the sting out of the game and Fishtoft comfortably held on to book their place in the next round of the cup. Two goals from Kevin Orton helped Wyberton A ease through to the next round following a 5-1 away win at Wrangle. Michael Reeson, Jason Allen and Ellis Wakefield were also on target for the visitors.